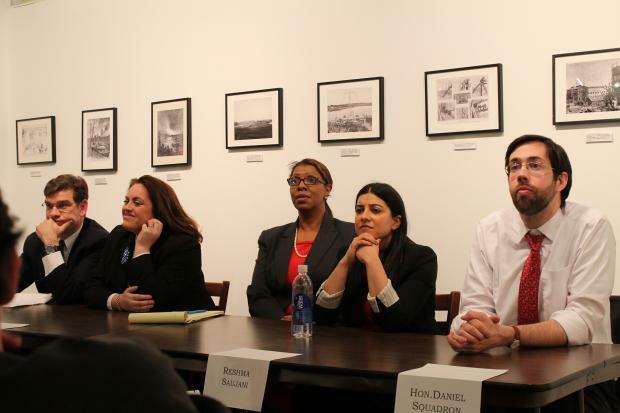 ASTORIA — The five candidates to replace Bill de Blasio as public advocate faced off for the first time Wednesday night in Queens, making their cases for why they should be the city’s next chief agitator. The crowded field of candidates includes State Sen. Daniel Squadron, City Councilwoman Letitia James, former Deputy Public Advocate Reshma Saujani, Cathy Guerriero and schools advocate Noah Gotbaum. De Blasio is running for mayor. Gotbaum, a long-time schools advocate and father of three, sold himself as the education candidate, arguing that the city needs a stronger voice to represent public school parents. Gotbaum is the stepson of former Public Advocate Betsy Gotbaum, who had endorsed Squadron. Guerriero, who lives on the Lower East Side and teaches education and politics at Columbia University and NYU, said she would focus on schools and small business. She harshly criticized mayoral control of schools and the proliferation of fines levied against merchants by a slew of city departments. She vowed to be “an aggressive, in-your-face public advocate" — and said she’d been drawn to the job ever since it was created when she was a college sophomore. "You mean the job is to dissent? The job is to fight?" she said. “I mean that’s what happens at my breakfast table at 8 o’clock." She praised de Blasio’s work cultivating “1,002 relationships” in the community, but said that neither he nor his predecessors had used the office to its full potential. “We haven’t seen this job in its fullest muscularity," she said. "We need an aggressive, thoughtful, thinking, smart, in-your-face advocate who's going to go down in flames to tell the truth," she said. Saujani, the former Deputy Public Advocate, who lost a bid to unseat Rep. Carolyn Maloney in 2010 in a landslide, took a softer tone. She spoke of her family's experience immigrating to the United States and said her priorities would be job creation, education, immigration and public safety. She also pointed to her role as a founder of Girls Who Code, which aims help young girls develop a passion for technology. “We need an innovator. We need someone who's not just going to talk about stuff, but get stuff done,” she said. "I get stuff done." Squadron, perhaps the best-known candidate on the panel, said he would push for better public schools and slammed the Board of Elections for its recent voting fiascoes. “It was through the looking glass,” he said of the trouble with the new computerized voting machines. But his strongest anger was directed at the MTA for scaling back bus service as part of a round of major service cuts in 2010. “It is absolutely unacceptable and a failure of government,” he said. James, who arrived late to the forum because of another meeting, stressed her background as a public defender and said she would fight to stop development that communities oppose. She pointed to the new Barclays Center, which she had advocated against. “The most pressing need in this city is not for a basketball arena,” she insisted. “It's for affordable housing." At one point, the panel was asked by an audience member to weigh in on City Planning Commissioner Amanda Burden, whom the questioner equated to 18th Century French Queen Marie Antoinette, who lived an opulent lifestyle, out-of-touch with the common man's suffering. James, however, had her own retort. “She’s definitely Robert Moses in a skirt,” she said. Moses, the former city Parks Commissioner credited with transforming the city's public spaces, has also been criticized as power-hungry, ignorant to community concerns and — some charge — racist.